Fried foods are impossible to resist, and a welcome treat on our road to healthy eating. Sure, we shouldn’t eat them everyday, but as a treat to bring balance and excitement to our healthy diets. Nobody fries shrimp (or anything for that matter) as well as the Japanese. 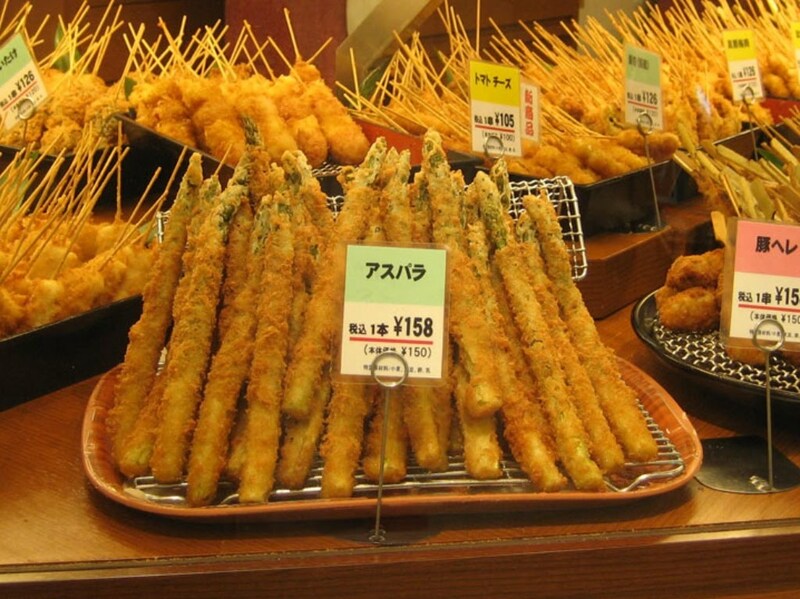 I discovered the ultimate version in the food courts of Yokohama Station – Ebi Furai. 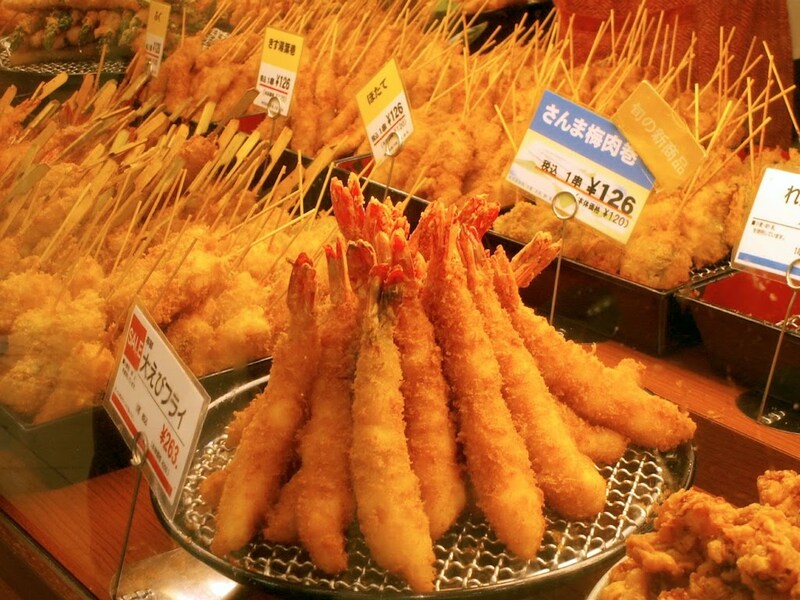 ‘Ebi’ is the Japanese word for ‘Shrimp’, and ‘Furai’ (fu-ra-e) is what it sounds like when a Japanese speaker says the English word ‘fry’. Start with premium shrimp (I strongly suggest large Wild Gulf White Shrimp from Fisherman’s Daughter); dip in tempura and then roll in panko breadcrumbs. The most satisfying fried shrimp ever – and they are so easy, anybody can do it! Here is the recipe, just in time for your Super football party. Buon Appetito! This is a crispy fried shrimp on a skewer that nobody can resist – possibly the ultimate appetizer! Prepare tempura batter according to directions and skip the next step – or go onto the next step to make simply from scratch. With a one cup measuring cup, measure flour into a medium bowl. In the same cup, add one egg and beat slightly, then add water to fill about 4/5 full and beat well. Stir liquids into flour, stirring just to moisten; the batter should be like a thin, lumpy pancake batter with bits of flour still showing – adjust with water or flour if needed. Over stirring will make the batter tough. Set aside. Heat oil for to 360 degrees for frying. Peel and de-vein shrimp and slide a long toothpick or short wooden skewer from tail to head of shrimp. You can straighten one large shrimp out and keep it straight with the skewer, or curl the shrimp and skewer two curled shrimp side by side (best with small or medium shrimp). Dip shrimp in batter, and then toss in panko crumbs.When several or all the shrimp are ready, place into hot oil (360-380 degrees) a few at a time – you can prop against the sides of your pan, or hold the shrimp with the stick – take care not to burn yourself! Fry shrimp quickly until golden brown, 1-2 minutes, and then drain on a rack or paper towels. Sprinkle hot shrimp with pinches of fine sea salt to taste. Serve hot with Ponzu, East-West Ginger Dipping Sauce, or your favorite dipping sauce.